Let me start out by saying that this recipe is INCREDIBLE! … Seriously, it is one of my favorite new dinners and it is EXTREMELY EASY to make! My husband said it reminded him exactly of his favorite pizza from one of his favorite spots to eat in his hometown in Arizona, the Rainforest Cafe. He loved it and probably would have eaten them all himself if I hadn’t reserved a couple for me and the kids :) He already scheduled it to be on the menu again next week. I love when I make something that has my husband going off about how good it is from his first bite. That being said, we are going to have a “real” moment right now. This picture will prove there is a reason I am still a “Chef in Training.” I goofed. I got so excited to have this dinner ready for my hubby when he got home from work, that I completely spaced to put the cheese INSIDE the calzone…. oops :) Has this happened to anyone else?! Well, you can imagine my frustration when I realized this as they were already in the oven baking…. So once they were done, what did I do? !… Sprinkled some cheese on top and let it bake at a lower temp until the cheese had melted. You really could cut back on the calories and skip the cheese (I did for mine and it was still DELICIOUS) but my hubby loves cheese… in fact, the more cheese-the better for him… so this is what we got. The end result was STILL FANTASTIC! But I definitely don’t think I will forget again! I highly debated just waiting until I made this recipe again to post a new picture, but I still like the picture and I want you to know that goofing while cooking happens to all of us. You are not alone. This recipe is extremely easy to throw together, has the perfect combination of flavors and is one your entire family will love! 12 frozen Rhodes dinner rolls, thawed to room temp. Place one frozen Rhodes dinner roll in each cup of a muffin tin. Cover with a light towel and let thaw to room temp and rise slightly. Roll each roll out as far as it can go. You want them pretty thin. Spread 2-3 tablespoons of your favorite BBQ sauce (I use Sweet Baby Ray's) on 6 of the 12 rolled dough pieces, leaving about ¼-1/2 inch border of dough on the outside. Place as much cooked and shredded rotisserie chicken as desired (about ¼ cup for each calzone). Place 1-2 tablespoons of chopped red onion over the tops of the chicken. Sprinkle 1-2 tablespoons of cilantro over the top of the onion. Sprinkled with shredded mozzarella cheese (about ⅛-1/4 cup per calzone). Make sure none of the filling touches ¼-1/2 inch dough boarder you left around the outside of your 6 calzones. Place a rolled out dough on top of each of your calzones and seal it up. Make sure it is sealed TIGHTLY so that none of the filling leaks out. Place the 6 calzones on a greased baking sheet. Bake at 350 for 20 minutes or until golden in color. Wow that is such a great idea! I love how simple it is. Except I've never heard of frozen Rhodes dinner rolls, I'll have to look that up. we discovered something similar this summer (thanks to my brother.) He calls it "dad's dinner night" It is tortillas brushed with BBQ sauce, then cover with diced chicken and diced onion and cheese. Put the other tortilla on top (BBQ side down) and hubby grills them on the grill. SOOOOOO good! I am sure this one is delicious too. Seriously salivating. BBQ chicken pizza is my FAVE. 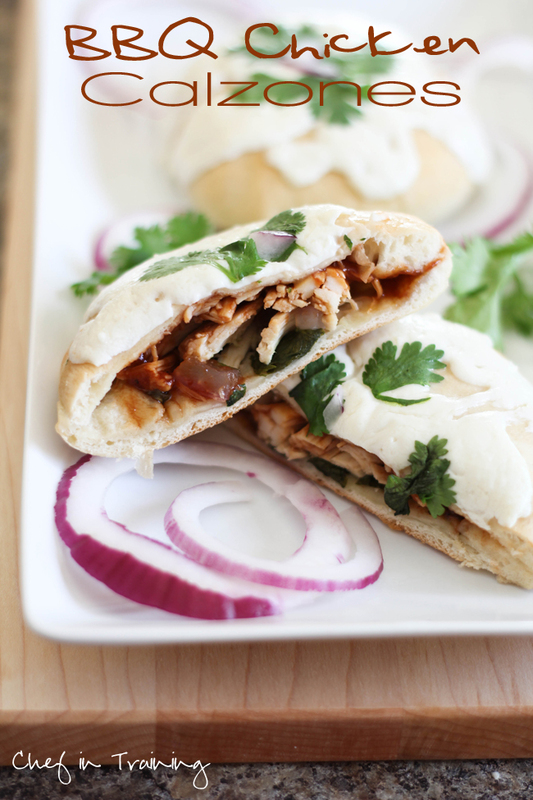 I love the cilantro + onions and the bbq sauce--so awesome! Never thought to stuff it into a calzone but now I won't stop thinking about it until I make it. These rock, Nikki! Don't feel bad....I forget ingredients all the time! And then I look in my fridge and think, "Why in the world do I have a HUGE container of arugula in here?" and I realize that 4 cups of it were supposed to be in the open-faced sandwiches I made three nights ago. Oops! Your calzones look great....I can't wait to try them sometime! I'm drooling over your photos again. I think my husband would love these! YUM! I pinned this and can't wait to make it! I made some calzones the other day using Rhodes rolls and I was so impressed with how awesome they turned out. I will need to try out your BBQ version now! Good to know they are still yummy without the cheese!! Ok-- while this looks fantastic. Not gonna lie-- my favorite part is the dipping sauce!!! Are you kidding me!?!??! Why have I never done that before???? I am SO doing that tonight. Maybe even right now. I don't even need anything to dip in it-- I'll just drink it! Always looking for new ingredients to fill calzones up with. I have some leftover smoked beer can chicken in my freezer. This sounds like the perfect way to finish it up! I do things like forget the cheese all the time!!! I am always looking for good recipes that don't include cheese, so good to know these are still good without, will def have to try them!! These definitely seem easy and tasty to make. Will have to give it a shot soon. So, if I can't find the frozen bread dough, what would you suggest in it's place? Are you suppose to stuff them while in the cupcake tin? Why do your "flops" always turn out FINE? The picture is still beautiful! Can't wait to make these for supper tonight!! !